The mother of a 22-year-old woman who was discharged from a Maryland hospital and left to fend for herself in freezing cold weather at a bus stop is speaking out to correct misconceptions about her daughter. The mother, who asked to be identified only as Cheryl, says she wants to "correct the misinformation that's out there" because her daughter, Rebecca, "was humiliated" by the incident. "There are people who are saying that my daughter is a drug addict, my daughter's a prostitute, that she's deaf," Cheryl told CBS News. "She's not deaf, not a prostitute, not a drug addict. My daughter has mental illness." 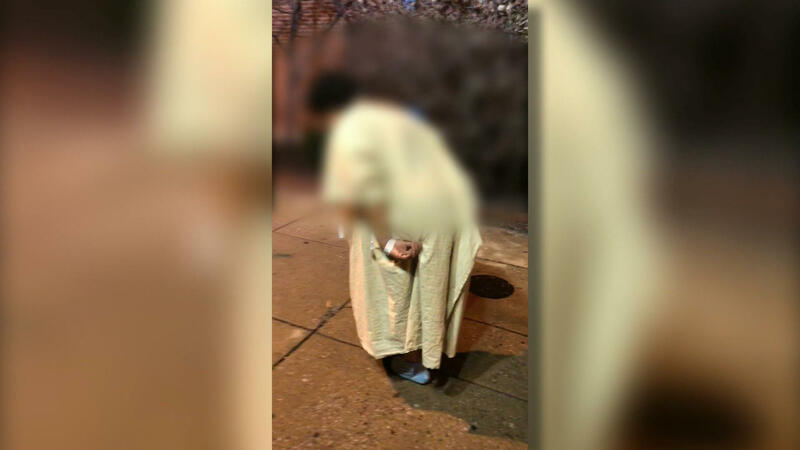 The case gained national attention when a bystander captured cellphone video of hospital workers leaving Rebecca on a downtown Baltimore street wearing only her flimsy hospital gown and socks in 30-degree weather. "My daughter was disposed of. She literally was disposed of. It's disgusting, heartbreaking, horrifying," Cheryl continued. "And if it's all of those things for me, I want people to know how does Rebecca feel? This was done to her. She was on the street with her body exposed. There was no human dignity at all." For the safety of her family, Cheryl chose not to disclose their last name to CBS News. According to Cheryl, Rebecca was diagnosed with mental illness — bipolar schizoaffective disorder — when she was 16 years old, and also has Asperger's syndrome, a form of autism. Rebecca lived in a residential youth program called Pathways from the time she turned 18 until Christmas Eve, when she was discharged for not taking her medication. "She has to be on meds, otherwise she has psychosis," Cheryl said. "She will have, uh, a manic episode." Cheryl says she has been trying to get legal guardianship of her adult daughter to gain control of her medication, housing and Social Security. But because of HIPAA patient privacy laws, she says doctors will not speak with her. "This is a byproduct of what the mental health system is," she said. "I cannot get any help for my daughter." Last month, Rebecca stopped reaching out to her family members so Cheryl tried to file a missing persons report with police. During the process, authorities notified her that Rebecca had been admitted to a hospital in Baltimore. Cheryl says she came across the disturbing video while scrolling through Facebook. At first, she didn't even realize that the woman in the clip was her daughter. "I didn't even know that it was my daughter initially," she said. "As he got close enough, I saw it was her and I got hysterical because in that moment, it was sheer fear that my daughter was going to die. I still haven't watched all of the video." Cheryl says she tried to contact the hospital and was told to reach out to their media relations department about the incident by email. "The hospital wasn't being helpful. I called the security department (and) they laughed at me. When I told them, 'That's my daughter in the video and I just need to find out if she's in the hospital,' they laughed at me," Cheryl said. "Every person that I talked to at the hospital either hung up on me or told me to email the hospital, and that everyone was going to tell me the same thing." The video of Rebecca went viral earlier this week on social media. It shows four University of Maryland Medical Center security guards wheeling her to a bus stop in her hospital gown. She can be heard crying out after they walk away. "It's obvious with looking at the video — even someone who doesn't know her, someone who doesn't know anything about mental illness — it was very apparent that she was having some sort of medical issue," Cheryl continued. "You could see she has a large lump on her forehead and her face was bloody. So, there was a medical issue. She was incoherent. A blind person, Hellen Keller, could see that my daughter was in need of medical attention." Imamu Baraka, the man who recorded the video, called 911 and medics wound up taking Rebecca back to the same hospital. Cheryl says she has since been transferred to a different facility where she is receiving treatment. "What was in that video was no empathy for a sick young woman, and, um, it was just so callous and heartless how they put her out there in the cold, exposed, and didn't know her history, didn't know her background," Cheryl said. "And I don't think they ever really cared because they weren't looking at her like a human being." The University of Maryland Medical Center apologized Thursday and promised a thorough investigation. In a written statement, the hospital states that they "share the shock and disappointment of many who have viewed the video. In the end, we clearly failed to fulfill our mission with this patient." Cheryl told CBS News that Suntha claimed that he has tried to reach out to her but couldn't get in contact with her. As of Thursday night she said she had yet to hear anything from him. "This was a hospital that has a psychiatric unit. They should know how to deal with mental health patients without dumping them out on the street in the cold, naked," she said. "They're supposed to be able to deal with mental health issues, and if they don't know how to deal with mental health issues, then they should close their doors." CBS News' Arthur Jones II contributed reporting.